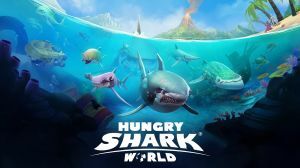 This sequel is similar to its predecessor 'Hungry Sharks Evolution', you must eat as much as you can so your shark grows from a pup into a 10 ton great white. To determine how quickly your shark grows into this feasome ocean killing machine will depend on how, where, what, and when you eat. There are 17 shark species in 7 different size tiers to collect. Note: This game is only compatible with devices running on Android 4.2 Jelly Bean or above. No discussions open for Hungry Shark World at the moment.